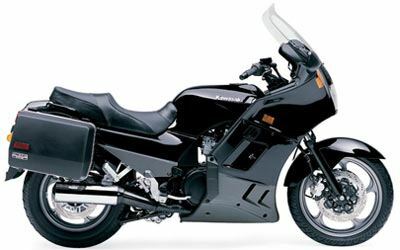 The Kawasaki Concours has everything a sport-touring motorcyclist needs, including superb wind protection, a comfortable saddle for two and hard luggage for extended journeys. Just as important, it also has everything a sport-touring motorcyclist wants, like the power and handling normally expected of a Kawasaki NINJA® sportbike. Comfort is a high priority on the Concours. It features a triple-density foam saddle, which is deeply contoured to comfortably seat both the rider and passenger. A full fairing creates an aerodynamic envelope for two when riding in a relaxed, upright riding position. Two lockable bins are on either side of the fairing for added convenience. The Concours also features a 7.5-gallon fuel tank for long-distance touring, and locking luggage detaches with the flip of a latch for overnight trips. Plus, the smooth flowing lines of the Concours adds an aesthetic touch, and special panels can be secured to the sides when the saddlebags and mounting brackets are removed. As a true sport-touring motorcycle, the Concours handles twisty backroads as easily as it cruises the highway, thanks to a rigid chassis and 997cc liquid-cooled four-cylinder engine. The engine produces strong power throughout the rev range and a gear-driven counterbalancer smoothes vibration. The engine is matched to a six-speed transmission to keep the engine at a relaxed rpm at highway speeds.